Huge apologies for the mini-hiatus I have taken from this blog! Now that I'm all done with my papers for school, I'm back in Japan to spend the holidays with my loved ones. First order of business: food. If you know me, I'm a huge foodie and the cuisine is one of my favorite parts of Japan. 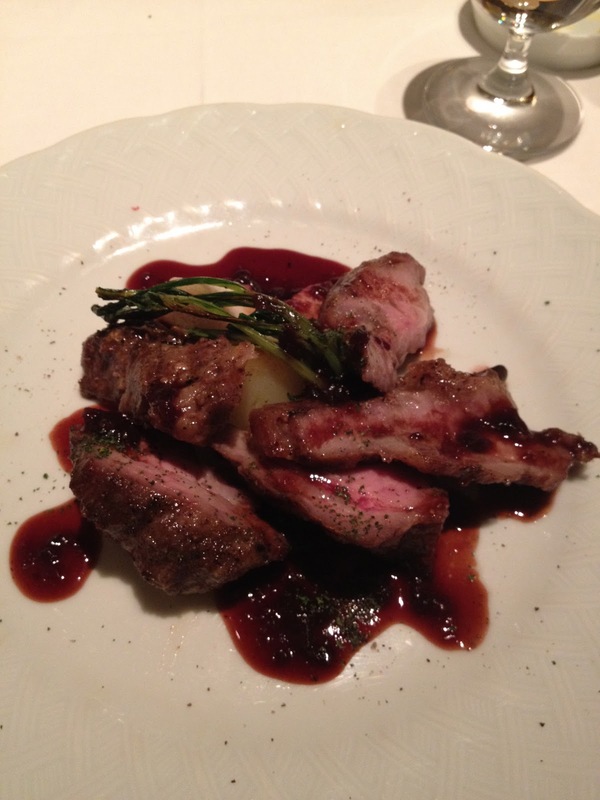 Last night, my mother, her friend, Sue, and I went to Infusion, a French restaurant in Sakurashinmachi. I always noticed it while walking to the station, but never had a chance to go. What a disappointment that I hadn't ever eaten there until last night! It was absolutely amazing! Infusion is a quaint little restaurant, with approximately 6 tables. They have a sommelier, and their chef is an award-winning chef, who has been featured in magazines and cooking shows in Japan. The ambiance is very sophisticated; no crying babies, quiet chatter, and very enjoyable for a nice dinner with friends, or your significant other. We had made our reservation for 7:00 PM, and when we arrived, there were only two tables taken. Perhaps it was because we were there on a Tuesday, but I was surprised at how empty it was. Anyway, onward bound with the food reviews! Mom and I started off with vermouth & kir, respectively, which were both delicious and only made me that much hungrier! We then each got a glass of champagne, then ordered two bottles of the Chablis. Needless, to say, we were pretty tipsy by the end of dinner, but anyway... We ordered the course menu, and chose our appetizer & main dish. 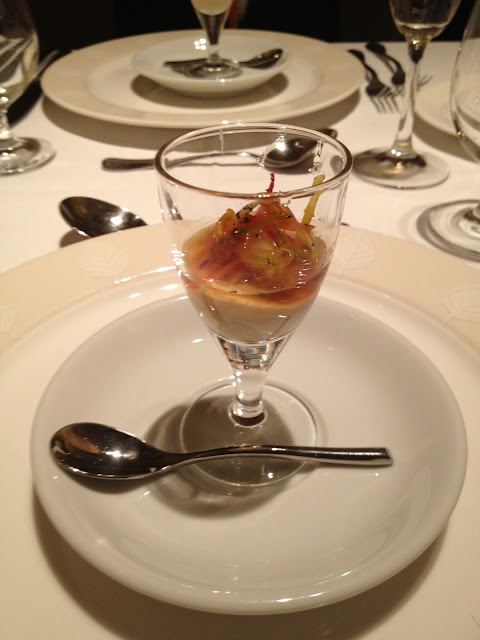 As an amuse, we were served a little mousse (I believe it was pumpkin), with a piece of succulent shrimp. We were then served our appetizers. 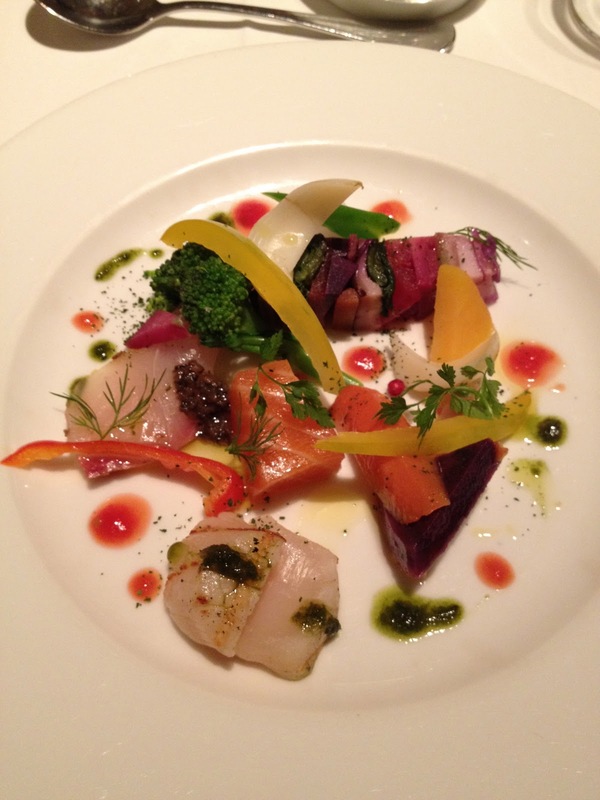 I had chosen the "Winter Hors-D'oeuvers," which came with an assortment of carpaccio-style fish, and vegetables. It was absolutely delectable! My mother ordered a hamachi carpaccio (also delicious) and Sue ordered the terrine. The presentation for each of these dishes were beautiful. We then had the choice of ordering a fish dish, or have the soup du jour, which was a pumpkin soup. I guess we're all pumpkin soup fans because that's what we all chose! My mother and then argued over who was going to get to order the Iberico Pork dish, because we both wanted to - but I won :) I ordered the Spanish Iberico Pork with Black Fig sauce, my mother ordered Grilled Berkshire Pork, and Sue got the Steamed Sea Bream. I cannot even start to explain how delicious the Iberico Pork was! All the dishes were delicious but honestly, mine was the winner. The fig sauce went so well with the pork; it was perfectly chewy, but tender at the same time, and mmmm I could eat that all day, every day! 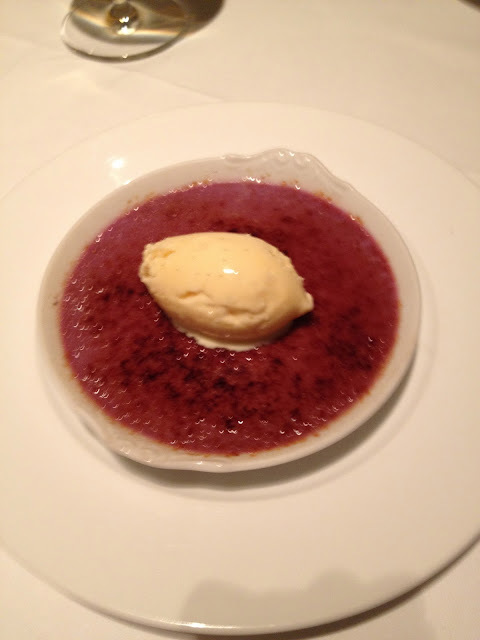 After finishing our main dishes and feeling slightly tipsy (& extremely stuffed), we were served our desserts. Boy oh boy were these delicious as well. Mom is known for hating sweets, except when there's creme brûlée as an option. So, she ordered the sweet potato creme brûlée, which I thought was a little odd but I guess if that's your thing... then you'll enjoy it - because she did. 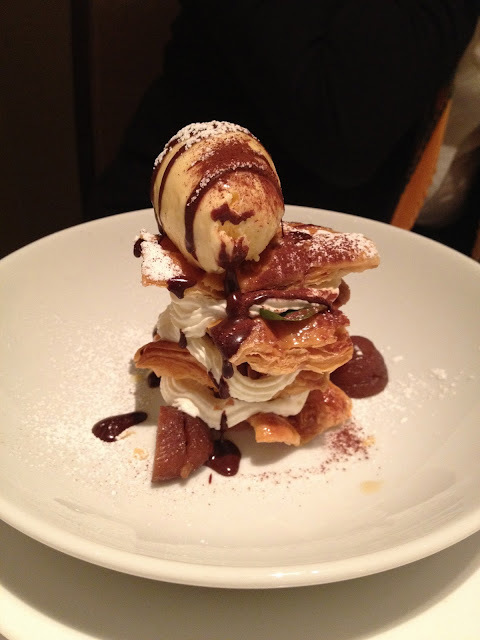 Being a sucker for chocolate, I ordered the chocolate soufflé with vanilla bean ice cream, and Sue ordered the millefeuille. That was the icing on the cake (no pun intended), we were dunzo. So full, so satisfied. Sorry for the very wordy review but I just had to - such a hidden gem! For those of you in the neighborhood, DEFINITELY check this quaint little restaurant out. You won't regret it! Great photos- you've made me pretty hungry now haha.